It's a 40B with custom laser cut acrylic panels, creating 3 sections for clown pairs and an overflow area for the ATS. Nice work!! ACE25 is breeding clowns to. Very nice. As a complete novice to ATS and looking at info on other threads, do you get a lot of growth on the mesh just using red LED's? Other people seem to say you need at least 1 blue for that size mesh. Just red LEDs for now. Not a whole lot of growth yet, but the tank has only one pair housed in it at the moment. Never experienced a cycle and all tests measure 0. I'll be moving two more pairs in this weekend. 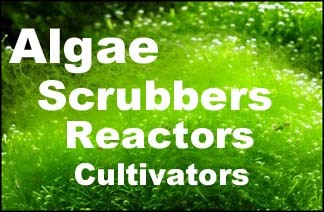 As an aside, I have a mini 1x6 horizontal scrubber on a 5 gallon nano lit with 2 red LEDs and the growth on that thing is bright green and thick. Before there was algae all over the glass and rocks. since I put in the scrubber the algae has disappeared. One thing to note, that screen has two small bald spots directly under the LEDs, probably because they are so close (2") and strong (60 degree optics china), but I have limited room and can't move the LEDs much higher. So I would put the LEDs 3-4" away from the screen and use a potentiometer to control the light in an ideal world. This mini scrubber was thrown together out of spare parts so oh well. For what it is, it's worked fabulously. Here's un update on the breeder system. All the pairs have been moved in. We have misbar percs on the left, snowflakes in the middle and picassos on the right. Readings so far 0 across the board. Never really had a cycle, seems the scrubber absorbed that mess. I have been feeding these guys several times a day. I have yet to clean the screen, probably will do so this weekend. I seeded the screen with a piece of screen from my shallow tank. The screen went from white to green, totally skipped the yucky brown stage I've got going on in my shallow tank scrubber. So the light box actually goes down inside the overflow? I had an idea to do something like this on a friend's tank but there wasn't room; he keeps his overflow area like 1/2 full with water.